Ketchikan, Alaska - Ketchikan resident Robert McRoberts said that he and Dale Bakkela were getting ready to cut a 350 year old cedar log into boards when McRoberts stopped the work because he could see a whale within the old log. After almost a year of carving, others are now able to see the whale within too. 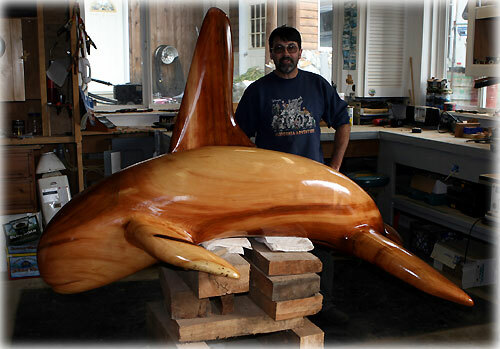 Except for the tall dorsal fin, McRoberts carved the whale from one piece of cedar. When finished, the whale will be mounted on a granite base. When asked what his plans are for this beautiful piece of artwork, smiling he said that he would love to have a nice Harley Davidson or a boat.